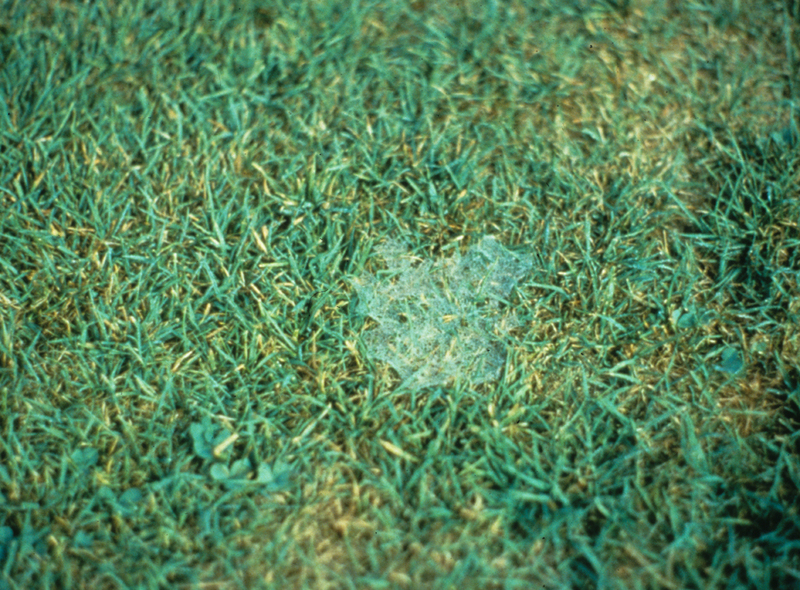 Dollar spot caused by Sclerotinia homoeocarpa is a common and persistent disease of most turfgrass species throughout the world. The disease is characterized by sunken, round, bleached to straw colored spots, ranging in size from 1-2 inches. 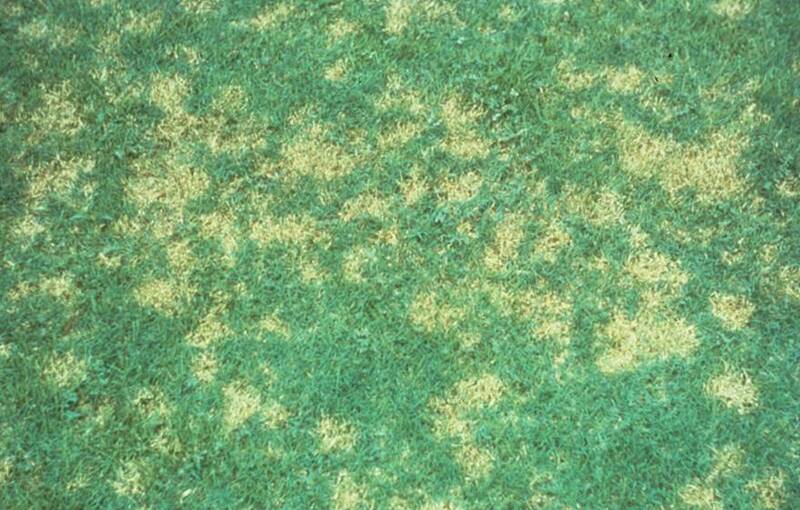 Where disease is severe, these spots may coalesce to form large, irregular areas of blighted turf. When the pathogen is active and dew is present, a white, cottony, or cobwebby growth of fungal mycelium is visible. Lesions on individual leaves are white to straw colored, commonly with a tan to reddish brown margin, and often hour-glass shaped. S. homoeocarpa survives unfavorable periods in infected plants or plant debris and as stromata (compact masses of mycelium) on leaf surfaces. The disease appears at temperatures between 60-90 °F and is favored by warm days, cool nights, and heavy dew. Dollar spot has the potential to be active from mid-May through mid-October. The optimal temperature and humidity requirements vary among biotypes of the fungus. The pathogen is spread by mowers, golf carts, golf shoes, wind, and water. Dollar spot is most severe in dry soils and where there is low nitrogen fertility. Low nitrogen fertility can reduce the efficacy of curative fungicide applications, because old infection centers often cannot adequately 'grow out' of former infection. Water deeply and infrequently. Do not allow moisture stress to occur. Remove dew and guttation fluids by mowing, rolling, whipping or poling greens early in the morning. Maintain adequate to high nitrogen fertility. Light, frequent applications will reduce disease severity and promote recovery. Prune trees and shrubs to improve air circulation and promote rapid drying of the turf. Newer cultivars of creeping bentgrass have been developed that are less susceptible to dollar spot. Organic fertilizers, composts, and biological control agents (biofungicides) may provide a level of control. Fungicide resistance has been found in the dollar spot pathogen for forty years, especially where fungicide applications are frequent (golf courses). Resistance has been reported for several groups of systemic fungicides: the sterol biosynthesis inhibitors (DMIs), dicarboximides, and benzimidazoles (thiophanate-methyl). To reduce the potential for resistance development follow label directions, apply fungicides preventatively during periods of high disease pressure, avoid repeated use of active ingredients in the same fungicide class or FRAC code, tank mix or alternate fungicides with different modes of action, and maximize cultural practices to reduce the need for fungicide applications. If reduced reduced fungicide control with the benzimidazole, demethylation inhibitor, dicarboximide, and SDHI fungicide classes is suspected, the UMass offers a Dollar Spot Fungicide Resistance Assay . For a listing of fungicides currently labeled to manage this disease, refer to the Disease Management chapter of UMass Extension's Professional Guide for IPM in Turf for Massachusetts .